The biblical lands come to life like never before, thanks to the latest in 3D imaging technology. This major revision of the Gold Medallion Award-winning Zondervan NIV Atlas of the Bible lets readers see the geography of Scripture with unprecedented detail. Featuring an expanded introduction to the biblical worldupdated to include Greece, Turkey, and Italy - the Zondervan Atlas of the Bible contains hundreds of full-color, multidimensional maps created with the help of Digital Elevation Modeling data. Arranged historically, the Atlas begins with Eden and traces the progression of the Old and New Testaments, providing an informative, accurate, and faithful companion to God's Word. Special chapters on biblical archaeology, the history of Jerusalem, and the disciplines of historical geography complement the state-of-the-art maps found in the Atlas. 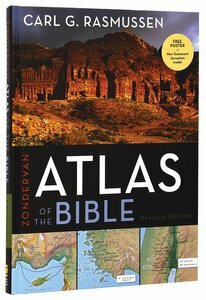 The Zondervan Atlas of the Bible is destined to become the definitive guide to biblical geography. This accessible yet exhaustive resource is a must-have for any student of the Bible. About "Zondervan Atlas of the Bible"
This thoroughly revised edition of the Gold Medallion Award-winning Zondervan NIV Atlas of the Bible uses innovative 3D imaging technology and over one hundred images to bring the biblical world to life with unprecedented clarity. Plus, over one hundred full-color, multidimensional maps trace the progression of Old and New Testament history, providing you with an accessible and accurate resource-a treasure trove of insights for students of the Bible. Zondervan Atlas of the Bible ... a thoroughly revised edition of the most comprehensive Bible atlas ever designed for * Students * Bible Study Groups * Adult Learners * Travelers/Pilgrims to the Lands of the Bible * Pastors * Teachers * All Lovers of the Bible This major revision of the Gold Medallion Award-winning Zondervan NIV Atlas of the Bible is a visual feast that will help you experience the geography and history of Scripture with unprecedented clarity. The first section of the Atlas introduces the 'playing board' of biblical history---using three--dimensional maps and photographic images to help the lands of the Bible come alive. The next section, arranged historically, begins with Eden and traces the historical progression of the Old and New Testaments. It provides an engaging, accurate, and faithful companion to God's Word---illuminating the text with over one hundred full-color, multidimensional maps created with the help of Digital Elevation Modeling data. It concludes with chapters on the history of Jerusalem, the disciplines of historical geography, and the most complete and accurate listing and discussion of place-names found in any atlas. Throughout the Atlas, innovative graphics, chronological charts, and over one hundred specially selected images help illuminate the geographical and historical context of biblical events. The Zondervan Atlas of the Bible is destined to become a favorite guide to biblical geography for students of the Bible. This accessible and complete resource will assist you as you enter into the world of the Bible as never before. Carl Rasmussen (Ph.D., Dropsie University) is a professor of Old Testament at Bethel University in St. Paul, Minnesota, and an adjunct professor at the Institute of Holy Land Studies in Jerusalem.. He created the 1989 version of the Zondervan NIV Atlas of the Bible, which sold over 70,000 copies, won the Gold Medal Medallion Book Award from the ECPA. It was also translated into German, marking it as an international success.